Even though it’s July, I’ve been thinking a lot about Halloween because my coworkers and I are trying to decide what our costume theme will be. Because of this, I’ve been in the mood for something spooky and paranormal. 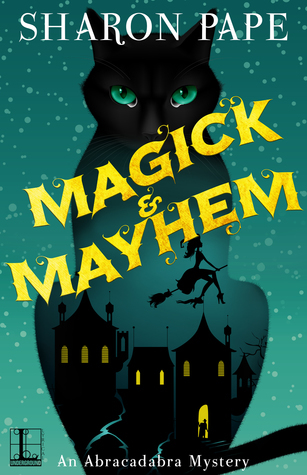 While no cozy is really spooky, I have found some great paranormal picks, and one of my new favorite series is the Abracadabra Mystery series by Sharon Pape, which begins with the book Magick & Mayhem. First off, can we just acknowledge how adorable this cover is? I love it so much! This book starts off with our spunky protagonist Kailyn Wilde who unexpectedly inherits her grandmother’s shop and ends up stumbling upon a murder. This jumpstarts a very cozy and humorous adventure through this small-town infused with magic. Kailyn comes from a long line of magical descendants, and some charming (literal) ghosts from her past help to guide her along the way. As she tries to prove her best friend’s innocence in this murder mystery, Kailyn also learns more about her powers and grows stronger in her magical practice. This book sets up a unique world of magic mystery. I was so pleased by the balance between traditional magical elements and fresh, new twists on the typical cozy witch story. The mystery itself was more detailed and richly plotted than the average cozy mystery. I enjoyed the adventure and the great world-building. Rather than stumbling upon clues, Kailyn and her sidekicks are smart and resourceful. They are really solving puzzles here to discover the identity of the real murderer. Kailyn is a really fun protagonist who is kind of insecure about her powers. She’s got a lot of growth to do, so I think this is the start of a really wonderful series where she will get more and more confident with each book. There are three books so far in this series, and I hope many more are to come. I have one from this series to read later on this year. Your review is making me look forward to it.